Our great nephew Jordan and great niece Breeze had a swim meet today in Birmingham so we headed out just after coffee. The skies were already thick with low-hanging clouds with a stiff wind out of the west that made goosebumps race up my arms as we climbed into Jilda's car for the trip into town. Thousands of kids from all over the state were at the complex and by the looks of the parking lots, each kid brought a bunch of kinfolks. Jilda wore a jacket, but I wore a long-sleeve shirt. 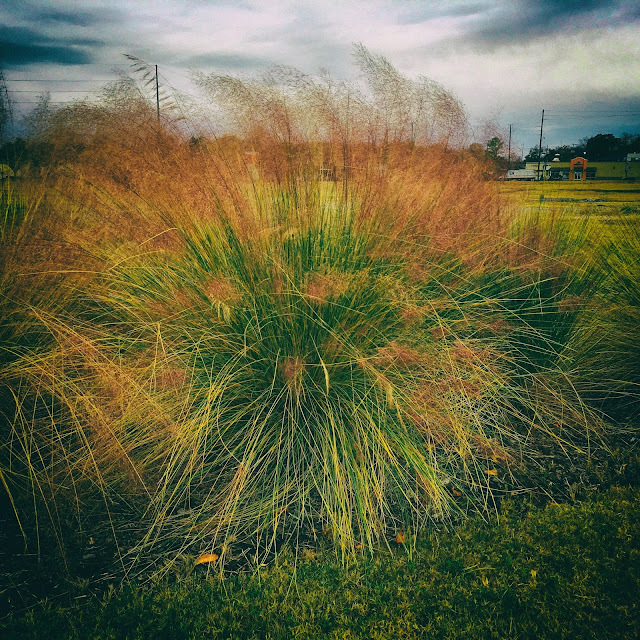 A clump of decorative grass by the walk caught my attention so I stepped over to grab a quick picture. Jilda was cold and she didn't slow down to wait on my so I had to hustle to catch up after the shot. Jordan and Breeze both did well in their respective races. We were proud of them both. Afterward, we did a little birthday shopping at Books A Million superstore. We buy a lot of books for the young folks in our family. This afternoon, I watched my college team spank the competition in the conference championship game so the Tide is headed for the playoffs. I'm hoping they continue to play well. As I sit here typing tonight rain in drumming on the metal roof. There is not thunder in the distance or forks of lightning in the night sky, just and old cold rain. Even though we got several inches this past week, we were still under a burn ban. But when the rain moves out next week, I think I'll be able to make S'mores in our fire pit for the first time this year and burn the mountain of debris in the backyard. Whether I'll be able to burn or not, I welcome the rain and I hope our friends north of us get rain too. Rain is a blessing. We are hoping for some soon. And aren't books the BEST present. To give or to receive. Here we take the rain for granted and many times we would gladly share our surplus. I hope that you get all the rain you need. Love that picture. Glad to hear about the rain and congrats to the kids on the swim meet. The southeast really needs the rain and I'm glad it is finally happening. The picture of the grass is glorious. You & Jilda are a GREAT great uncle & aunt!! Gorgeous photo! Rain is a blessing, especially, when you're not getting any! Yummy, S'mores! Glad you're finally getting some much needed rain.